William LaRue Jones and the UI Symphony Orchestra open a dramatic program on the new Hancher stage with the world premiere of alumnus composer Ching-Chu Hu’s The Phoenix. In a spectacle for the eyes and ears, the UISO will perform Mahler’s monumental “Resurrection” Symphony, an epic musical journey that explores the themes of life and death. 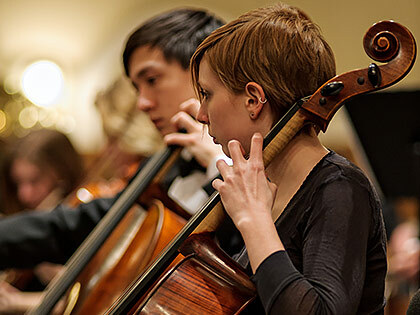 Joined by UI School of Music alumni Michèle Crider and Ann Cravero, university choirs, and hundreds of student and alumni musicians, this will be a concert you won’t soon forget. Seating will be limited for this free concert, and audience members are highly encouraged to arrive early. Hancher's entrances will open at 6:30 pm; doors into the Auditorium will open at 6:45 pm. The concert will be live streamed and will be posted for later viewing, as well.